Hōshō Kurō Tomoharu was a great figure who revived the traditional art of Noh and immortalised it with his sworn friend, Umewaka Minoru, when it was dying during the Meiji Restoration. Kurō Tomoharu was named as one of "the Three Masters of the Meiji Era." He was praised for the dignity of his performance that put him above rivalry, and he was admired for his great chanting techniques with his innately beautiful voice. Despite his superb reputation, he was strict with himself and pursued the profundities of his art throughout his life. He applied himself to Noh with devotion and intensity, having a keen sense of honour, human kindness, and responsibility as the head of the school. He was a man of a broad mind who charmed the people in the Noh community regardless of their different schools. As a result, Kurō Tomoharu was to play a part in leading the entire Noh community, which was dying at that time, and in achieving the beginnings of prosperity. Kurō Tomoharu was born in 1837 (Tenpō 8) as the second son of Hōshō Yagorō Tomoyuki, who was the fifteenth-generation head of the school and well renowned at that time. Yagorō Tomoyuki was renowned as a master with outstanding techniques, and nominated as the instructor for the family of the Shōgun. Kurō Tomoharu was said to be another promising young actor, who showed talent from childhood, and he had fair success as a government-patronised actor before he turned 12. Because his elder brother had died young, he succeeded to the head of the house when he was only 17. It can be easily imagined that because of his excellent techniques and personality, he was never scorned for his young age. However, the social change associated with the Meiji Restoration was a great challenge to Kurō Tomoharu, who sacrificed everything for his art. His performance of "Hagoromo" for the Prince of Wales in 1869 (Meiji 2) is on record, but he seemed to have had few opportunities to appear on stage because he lost his position. He tried out of sheer necessity to make his living in farming, and went to Itabashi in Tokyo, counting on one of his acquaintances for help. He spent about one year there. It was during that time that Umewaka Minoru met him frequently and encouraged him to return to the stage. Following Minoru's earnest persuasion, Kurō Tomoharu cultivated friendship with him and appeared on the stage of the Umewaka family. A great turning point for Kurō Tomoharu was in 1876 (Meiji 9) when a Noh performance for the Emperor was held at Umewaka Minoru's discretion at Iwakura Tomomi's residence. He visited Minoru backstage and was asked to perform on stage, and performed some pieces including Part Two of "Kumasaka." Iwakura Tomomi, an influential politician, was impressed by his techniques, and asked him to be his instructor. After Kurō Tomoharu acquired support from several influential persons, including Lord Iwakura, he gave many excellent performances with masters of the Meiji era such as Umewaka Minoru and Sakurama Banma, which included several performances for the Emperor and others at the openings of theatres. In 1906 (Meiji 39), he performed "Ataka," which was his last performance as a formal Noh play. After that he supported many Noh performances behind the scenes, and looked after his followers. He died with many honours in 1917 (Taishō 6). 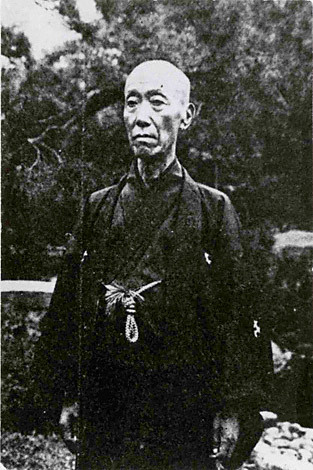 As the head of the Hōshō school, Kurō Tomoharu led Hōshō-kai (the Hōshō society), founded in 1893 (Meiji 26), and became a prop and stay of the entire Noh community. He was extremely strict in pursuit of the art, and affirmed that there was neither a good actor nor expert in the school, to say nothing of a master. He severely warned actors against taking excessive pride in their performance and thoroughly committed himself to the profound art of Noh. Kurō Tomoharu's sincerity toward the art of Noh was said to have been inculcated in many of the talented actors who helped to foster the Hōshō school, such as Matsumoto Nagashi, Noguchi Kanesuke, or Kondō Kenzō. He also supported the development of Noh by vigorously promoting cooperation and close collaboration with actors of different schools, musicians, and Kyogen-kata (actors who perform in comic interludes), and by increasing opportunities for the actors to appear on stage. For example, he gave opportunities for improvement to Sakurama Kintarō, the son of Banma and later called Kyūsen, by asking him to appear in the monthly programmes of the Hōshō-kai. In several documents, you will find his nicknames "Fukagawa," "Fukagawa-san," and "The Master in Fukagawa," because he lived in Fukagawa, an old section in Tokyo, for many years. This episode enables us to glimpse his natural virtue.